Today I thought I'd share some of the details from Mathilde's recent circus themed birthday party. A circus theme is so much fun and is always popular with both boys and girls of all ages. There are so many great options out there for decorating for a circus theme, and you can keep it as simple or as over the top as you like. I like to aim for something right in the middle. A definite theme but not too much. The items I'm sharing below can be mixed and matched depending on how much of a theme you'd like. 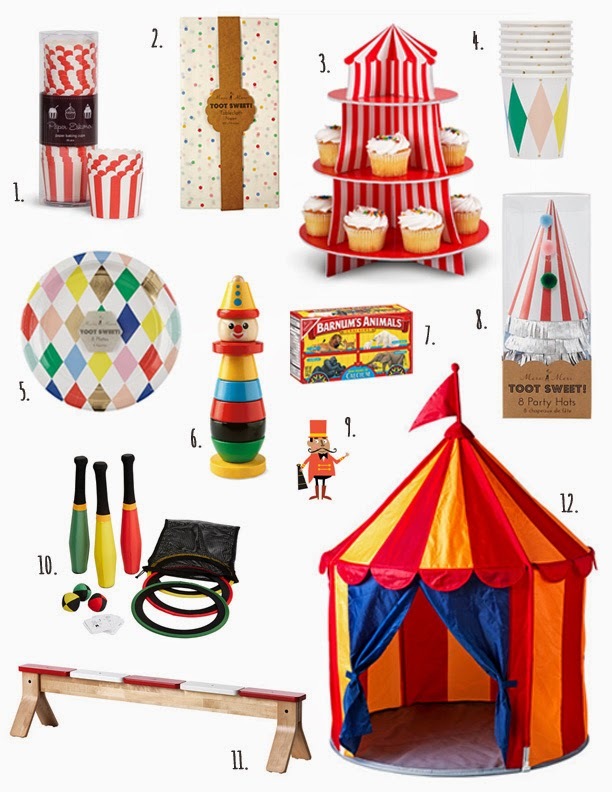 Here's a look at some of my favorite items for a circus themed party. You can click the links below to purchase. These red and white striped baking cups are perfect for a circus theme. They keep their color after baking and are nice and sturdy. I also used one upside down as part of Mathilde's birthday cake topper with a Schleich bear decorated with a ruff and party hat standing on top. You can see it here. The table on our roof deck faces the elements all day which, combined with being used by other tenants regularly, means that it doesn't always look the nicest. This paper table cloth covered it nicely and added a little color. Due to it being a little windy, I taped it to the underside of the table to keep it in place. What better way to display cupcakes for a circus themed party! The reviews on Amazon are quite mixed but I found this foam core stand to be well made and very sturdy. I had half expected to throw it away after the party but it looks as good as new. Seeing as it can be pulled apart and stored flat I'll be keeping it for future parties. I love the harlequin pattern on these cups and the touches of gold add a little sparkle. The pattern is perfect for a circus themed party but can be used for so many other occasions too. The coordinating plates to go with the harlequin cups. There are also matching napkins available. A perfect toy for the littlest party guests to play with. Mathilde received one of these for her birthday from Lola and it went perfectly with the circus theme. I gave packs of Barnum's Animal Crackers out as party favors. The simplest part favors ever! I had thought about including a few other items and putting them in little gift bags but I just love the classic packaging of these crackers and they were perfect for a circus theme. I usually make party hats for guests but I couldn't go past these hats when I saw them. They come in a mixed pack of stripes and spots and coordinate wonderfully with the rest of the Meri Meri Toot Sweet range. The hats have both elastic and ribbon for tying them on - practical and pretty! We almost always have temporary tattoos at kids' parties and Tattly make the best you can find. The designs are cute and the quality is excellent. Sometimes I put temporary tattoos in party bags and other times I set up a tattoo station at the party. I actually already had another juggling set in the cupboard for the kids to use at the party, but I prefer this one from Ikea. As part of Ikea's Stockholm range, this balance bench is one of their higher quality products. It was perfect for Mathilde's circus themed party but it also gets used daily in out home. The girls balance on it, they use it as extra seating, and it sits in our hallway where it can be used as a place to sit down and take shoes off without looking too much like a toy. The kids loved playing in the circus tent. This now sits in the corner of the girls' room and serves as a reading nook with Ava's little arm chair in it. At the party the kids loved hiding out in the tent for a little bit of quiet amid all of the chaos that comes when you combine kids, party games and lots of sugar! Have you ever thrown a circus themed party before? If you have any other circus themed accessories you'd like to share post a link in the comments. Really thanks dear for these useful hints on circus party. My son is a big fan of circus and demanding for circus theme party. Your post gave us some good points to throw this kind of parties. Now I will easily book Los Angeles event venues for circus theme party. Thanks dear for your support!